BOP ON TREND: Tell Me How You Really Feel. Here's some fun stuff to send you into the weekend via Singer22. With so many sales going on this time of year, it is hard to pass up the opportunity to splurge a bit. Using code FALL30, you can indulge in casual quote tees that you'd love to wear strictly for amusement and not at all to be taken seriously (read: tongue-in-cheek on the cheap). 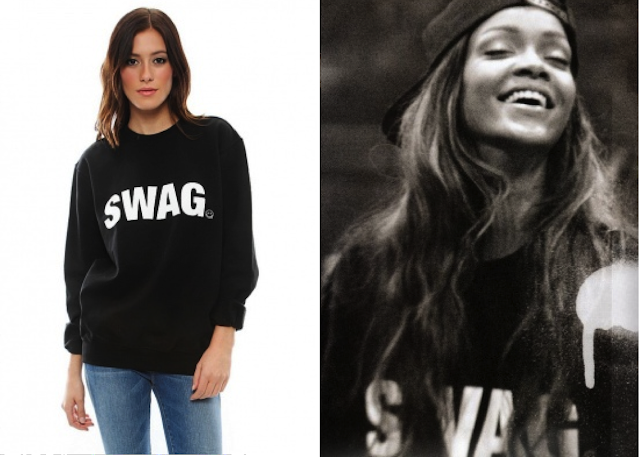 Even bad gal RiRi is getting in on this swag. Local Heroes, Swag Sweatshirt, only $77 with an extra 30% off.